NETWORK UPDATE: SUNDAY NIGHT FOOTBALL adjusted to 8.4 in final numbers, up 0.2 from last week (which faced the World Series). Post-football adjustment, 60 MINUTES lost 0.4, and MADAM SECRETARY dipped 0.1. In addition, FAMILY GUY and ONCE UPON A TIME each gained 0.1. CABLE HIGHLIGHTS: One guess on what topped Sunday cable: THE WALKING DEAD, however, took a rather heavy 0.59 drop from last week to 6.19, while TALKING DEAD was up 0.14 to 2.46, and COMIC BOOK MEN was at 0.56. 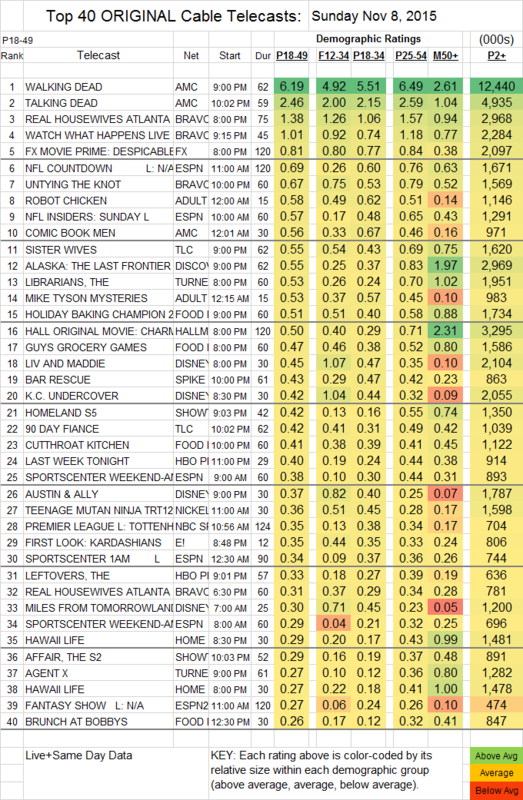 Bravo’s REAL HOUSEWIVES OF ATLANTA returned at 1.38, up 0.64 from last week’s ORANGE COUNTY installment, and the premiere of UNTYING THE KNOT later in the evening (after a special WATCH WHAT HAPPENS LIVE) was at 0.67. Adult Swim’s ROBOT CHICKEN was up 0.05 to 0.58, and MIKE TYSON MYSTERIES gained 0.13 to 0.53. TLC’s SISTER WIVES rose 0.12 to 0.55. On Discovery, ALASKA: THE LAST FRONTIER was steady at 0.55. On TNT, THE LIBRARIANS was at 0.53, midway between last week’s 0.63/0.44 for the two-hour season premiere, but AGENT X got off to a soft start at 0.27, and fell to 0.20 by the 2d hour of its own premiere. Also premiering was Starz’s FLESH AND BONE, at 0.06/190K. Hallmark continued in the early holiday spirit, with CHARMING CHRISTMAS at 0.50. There was more holiday cheer at Food Network, where HOLIDAY BAKING CHAMPION WAS AT 0.51, while GUY’S GROCERY GAMES slipped 0.02 to 0.47, and CUTTHROAT KITCHEN was up 0.04 to 0.41. 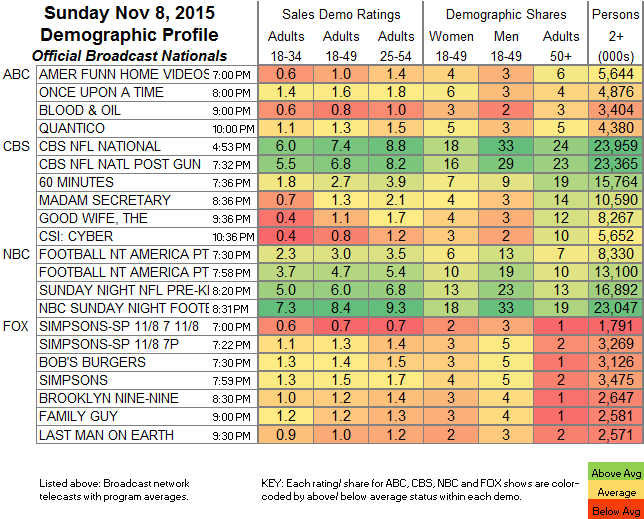 On Showtime, HOMELAND was up 0.04 to 0.42, and THE AFFAIR continued rising, up 0.02 to 0.29. Things were quieter at HBO, where THE LEFTOVERS climbed 0.05 to 0.33, GETTING ON premiered its final season at 0.10, and LAST WEEK TONIGHT rose 0.11 to 0.40. On E!, DASH DOLLS gained 0.04 to 0.25.